Can’t afford a Caribbean vacation? No problem! I am sharing my 10 favorite products that will transport you to a tropical island this winter. When you think of the scents and views of a tropical island, what comes to mind? Is it coconut, mango, the ocean breeze, oranges, pineapple, flora, or aloe? All 7 of these things are what make a trip to the beach well worth it. While we can’t always be on island time, we can bring the experience right into our bathrooms with the help of some amazing beauty and skincare products. There is no better feeling in the world than the feeling of putting aloe on your skin. After a long day in the sun this succulent’s gel is extremely hydrating. Try these sheet masks that will provide an extra boost of aloe-infused rejuvenation. Aloe just isn’t for summer sunburns, it is something your skin can benefit from all year round. Try relaxing with an aloe sheet mask while listening to sounds of the ocean in your headphones. Maybe cut some cucumbers for your eyes if you really feel like pampering yourself. 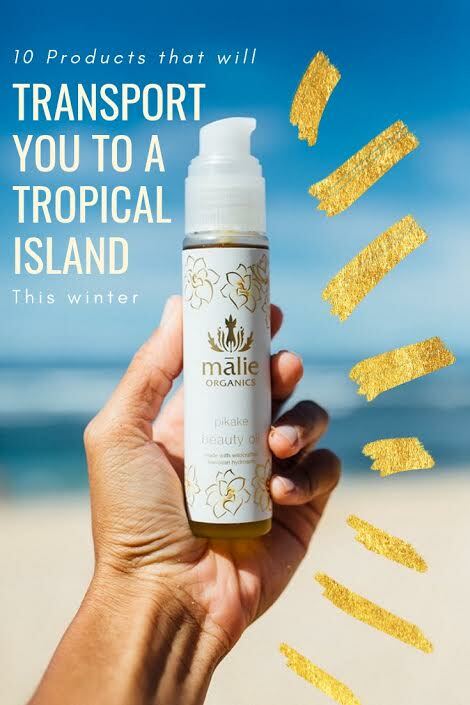 One of my favorite beauty brands is Malie Organics out of Hawaii. Their products smell heavenly! Honestly, words cannot do it justice – you just need to experience the potent Hawaiian flora for your own. My favorite product is the beauty oil, but I also love the scrub, shampoo and conditioner, body lotion and diffuser. As for my favorite scent.. that is tied with the pikake and plumeria. Both are gorgeous flowers native to Hawaii. I love that this brand is true to its roots. Using their products truly make me feel like I am on a Hawaiian escape. The brand Sol de Janeiro is Brazil’s spirit in a jar. Known for their Brazilian BumBum Cream, the scents of their products will transport you to the beaches of Brazil. Made with Cupuaçu Butter, Açaí Oil, and Coconut Oil, the fragrance smells like Pistachio and Salted Caramel – good enough to eat (I’m not kidding, haha). Want to achieve beachy, gorgeous hair even while the ocean has frozen over to hell and back? Me too, girl. Thanks to Bumble&Bumble you can wash your hair with the Surf Shampoo & Conditioner for beachy waves with full-bodied style, and the refreshing scent of the sea! These products, along with the entire Surf collection, are perfect for an endless summer look in every season. They also have an amazing coconut line that your hair will love! Is there anyone else who won’t buy anything else but freshly squeezed OJ?! Call me boujie, but nothing beats orange juice when it’s fresh! OJ always reminds me of the tropics. From Florida to anywhere in the Caribbean there is freshly squeezed juice flowing every day! Oranges are just as good as your skin as they are for your taste buds. I love the bright, refreshing scent of this citrus. You can find it in the Clarins Exfoliating Cleanser with Orange Extract and in these under eye masks. Adding a little vitamin C to your skincare regime is the best thing you can do for your skin! Treat yourself to a tropical delight with some orange-infused skincare products. If you haven’t jumped on the Schimdt’s band wagon then you are missing out! They are revolutionizing deodorant one armtpit at a time. There is no aluminum, parabens, or phthalates in Schmidt’s deodorants. Their scents are all-natural, and feature some paradise-inspired fruits like Coconut & Pineapple. Because why stop short at body wash, hair products, and lotions? Your under arms could smell like a Bali vacation all day! I like coconuts, you can break them open and they smell like ladies lying in the sun. If you haven’t tried Palmer’s Coconut line you are missing out! I love how refreshing this fruit is, and even more so how versatile it is. The Palmer’s coconut oil is extremely hydrating and smells delicious. Another brand I love is Sun Bum. They will have you smelling like a piña colada all year long. I love their chapstick, I keep it in my car for when I need a little tropical pick me up.